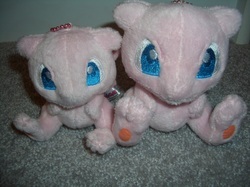 Mew plush mostly come in two varieties: Adorable or ugly+derpy. I won't be collecting every single plush, just the ones I really like. 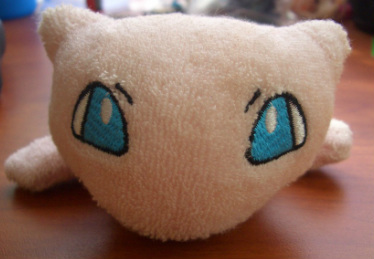 Mew also has a lot of "angry eyebrow" problems. 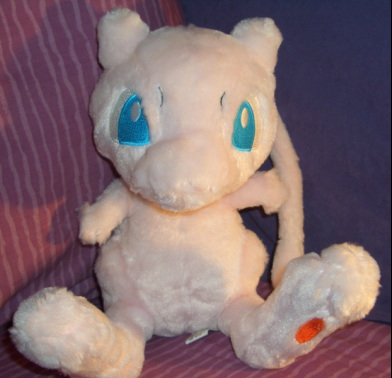 This is my favorite Mew item of all time! 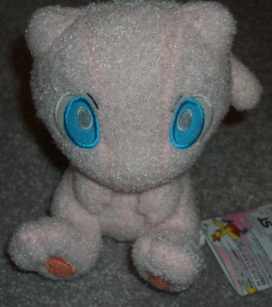 Super adorable, fuzzy and soft Pokemon Center Mew plush. 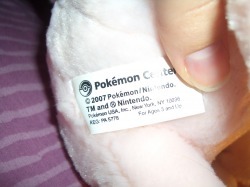 Back when the Pokemon Center still had a website, I used to browse through it and make lists of which TOMYs I would get next time I went to the City/PC store. 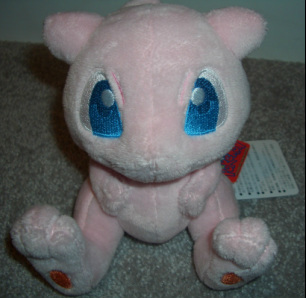 Eventually I ran across this plush on there, but I never saw it in the store. 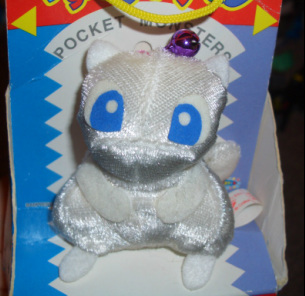 At this point in time, I was too afraid to ask my parents to buy it for me because I didn't want to hear the whole "Pfft no we're not buying stupid Pokemon stuff off the website youre __ years old already!" After awhile it was taken off the site. Months later, it was back! 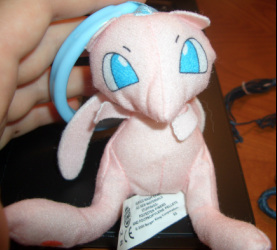 At the end of the 2007 school year, my friend offered to get it for me with her order so we could split the shipping and I would pay her back in cash! 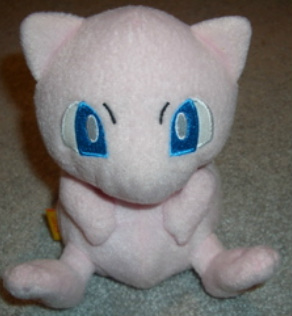 I couldn't resist, and this Mew became my first "online purchase". I believe it cost around $20 or so, and damn am I happy I bought it XD Also very thankful that I even had the opportunity! 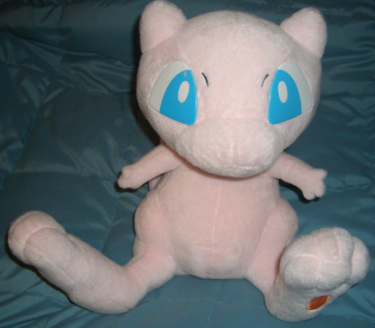 I just absolutely love this plush, I think it's the best Mew plush that's ever been made! I bring it with me to college every semester, and there's always a spot on my bed for it :) Apparently there was once a hang tag on her hand, but I must have cut that off immediately because I don't remember it at all. I'm also going to take a guess and say this is the rarest item I have in my collection. Somehow I have incredible luck with this plus, and I ended up getting 2 more off of eBay for incredible prices for myself. One is from 2006 (my original is 2007), and is slightly different! 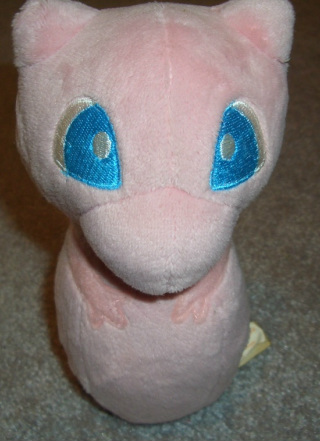 The fur is a darker pink, looks a little smaller, and has a slighly different face pattern! 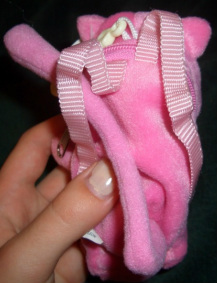 My third one is the 2007 version, and came with her tail string cut. 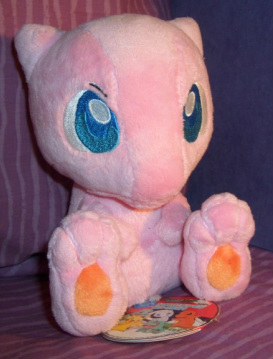 And now it's time to spam this page with some more pictures of this amazing plush! 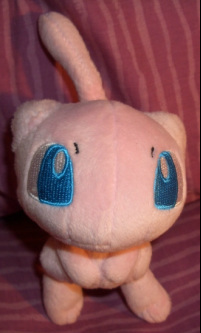 Since I love the Mew Pokedoll art, when the new tags of the Pokedolls came out, I had to buy another Mew XD This one was purchased from Epcot while I was on vacation. 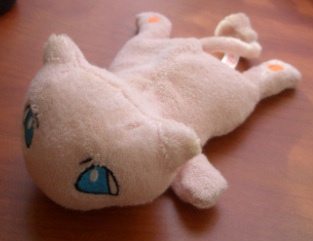 This adorable Mew was part of the most recent "Walky" promotion across the Pokemon Centers in Japan. Thankfully I was able to order it from denkimouse! The concept comes from the Pokemon sprites in Heart Gold and Soul Silver that follow after your trainer. 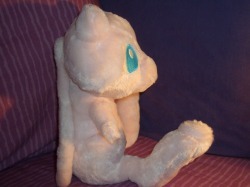 Mew here is in a pose as if she were walking behind your trainer. 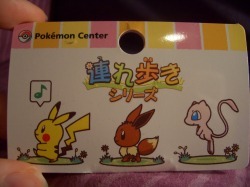 The keychain also has some adorable charms that show some recognizable emotions from the game when you talk to your Pokemon! 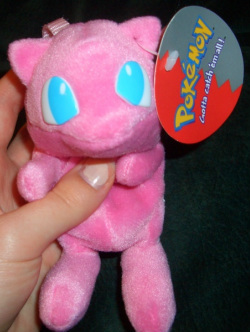 When the Mew Walky promo first came out, I had doubts about this plush. I didn't really like the way her mouth looked at all. About 8 months later, I decided I should just buy the damn thing before they disappear and become way too expensive. The mouth still kinda bothers me though. 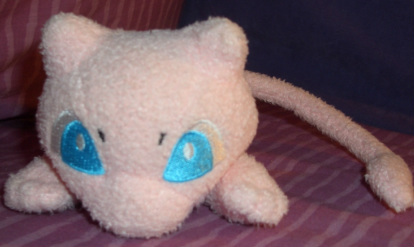 The plush itself is SUPER soft and fuzzy, and obviously adorable. 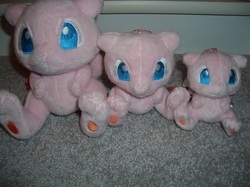 Seeing them in person really tempts you to want to buy them all XD Really wonderful plush. 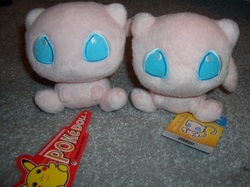 They're about the size of a Pokedoll, with some of them being a little bit taller. So we all knew there was a keychain version of these plush, but what we didn't know was that there are actually TWO keychain versions! 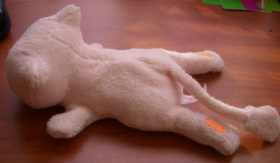 One is about an inch smaller, and has a flat tail instead of a stuffed one. 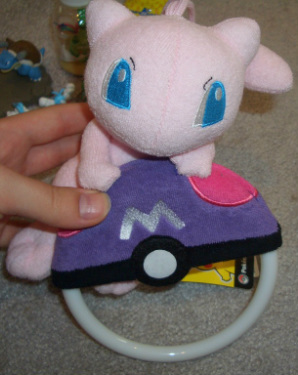 On both sizes, Mew's foot pads are some sort of plastic while on the normal version above the pads are sewn on. This is one super cute towel holder! I've always liked this plush, but I only saw it on Y!J before I had signed up for a deputy service. After using Noppin for 6 months, I found and won one with zero competition! :D It's in mint condition and still has the hang tag. 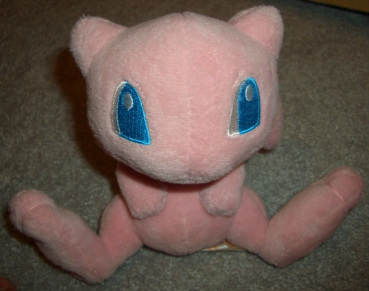 South American Mew Plush - "Charmeleon"
Oh, you know you cant resist the derpy derp derp eyes! thrutgrkgjrtehtk Shes so cute ;-; I was super excited to get this little plush! Its the first really super rare/unique item Ive ever had, and I dont think my luck will hold out for another :P Its crazy to think "Im the only one around that has this item!" But while it is a cool feeling, I really hope these pop up again and more collectors get a chance to own one too! SO FLAT. SO ADORABLE. SO TERRYCLOTH. I saw this on eBay in a massive $70 BIN lot and flipped. After a bunch of headdesk-worthy PMs, the seller agreed to list it separately, but strictly as an auction. I was convinced that now it would auction off and off for $70+ JUST BECAUSE. If you didnt know, Murphys Law and I are best friends for LIFE. Anywya, I ended up winning it at a decent $20, and eBay Bucks brought it down even further. AHHHHHHH. 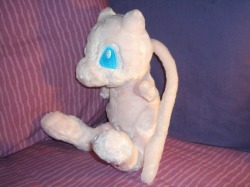 This is one big Mew plush! Definitely the biggest one I own! I won this off of Y!J for a very low price ($45-$50ish) compared to what I've seen them go for ($100+) . Has a working sound box too! 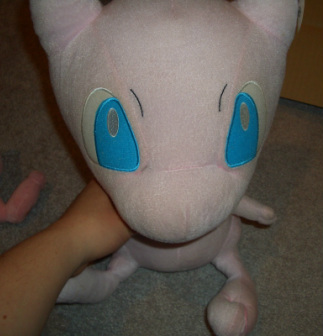 Its a really great looking plush, and very well made! 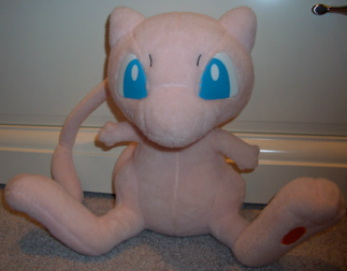 This Mew can turn into a Pokeball if you unzip the back of her head! 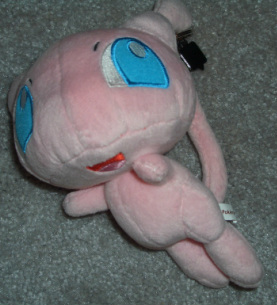 I don't anything about this plush or where it came from. 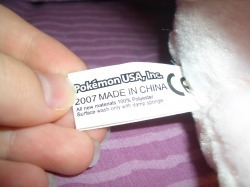 Im pretty sure its not on the PokePlushProject either. 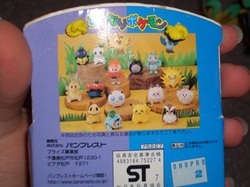 Mew, along with Munchlax and Pikachu, were made into these 2 inch thick cushion things for the 2005 8th movie promotions. All three are pretty rare, as they didn't show up often to begin with back in 05. 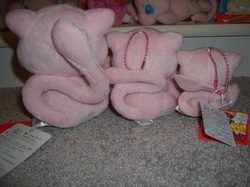 I was able to win the entire set off of Y!J, and of course kept Mew for myself! This thing is awesome (and huge). 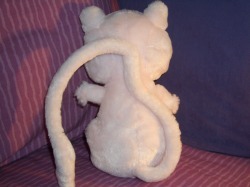 Looks incredibly similar to my favorite fuzzy PokeCen Mew! 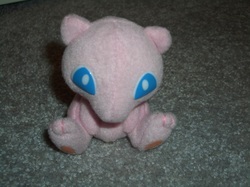 Doesnt help thats its pretty much the same size too =P Still, its a very nicely made plush and very soft! SO LITTLE. SO ADORABLE. SO FINALLY MINE. 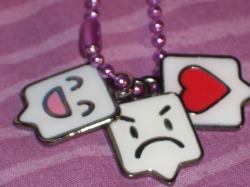 Yes, its actually supposed to have a little metal ball-chain keychain in that white loop, but it didn;t come with one. Not a big deal since that's the most generic keychain ever and if I want to put one on there, it'll be super easy to get one! So adorable!!!! 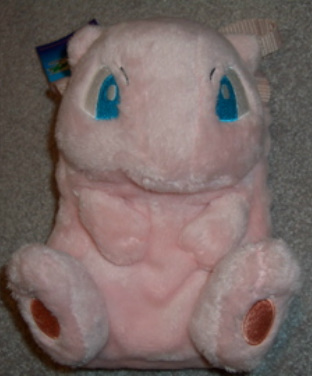 Another plush that I always wanted but would miss in a sales post or would be too expensive for me on eBay/Y!J. 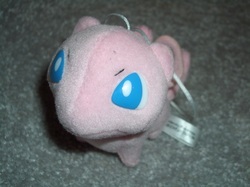 I got this plush and the one above for $25. It's in perfect shape, tags and all! 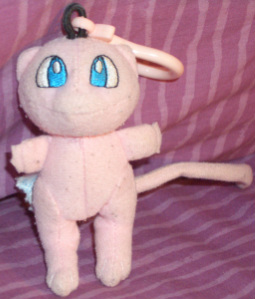 This Mew came from a random plush lot on eBay. It wasn't until I got them in the mail that I figured out what this plush actually was! 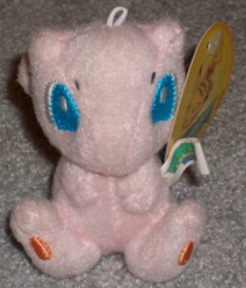 There apparently used to be a gold loop on her head to hang up as a Christmas ornament, from the Pokemon Center. 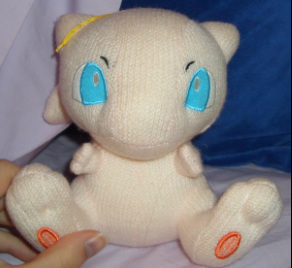 I really like the knit style of the plush! This plush is super soft! 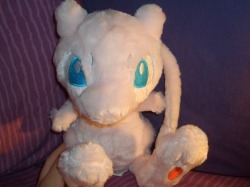 Got him from a GA I hosted, and even though it took the (eBay) seller a month to get the plush to me, it was worth the wait for this cutie :P I also couldn't tell from the listed picture if it had a tag, and luckily enough he did! However, I recently noticed he only has ONE EYEBROW D:!!!!! 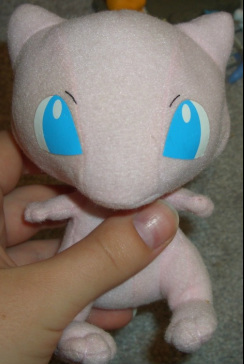 I was more shocked that it took me a few days to actually realize than I was about the fact that my Mew has one eyebrow XD Oh well. 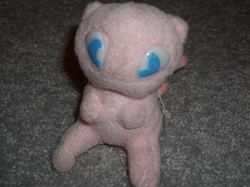 Confused Mew. A lot smaller than I expect it to be! Regardless, she is insanely cute and fuzzy. I got this one as a result of a Group Auction I ran with another community member, sapphire_kun! 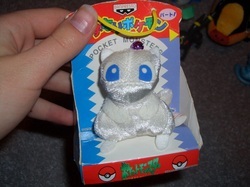 Bell Plush (すずなりポケモンぬいぐるみ Suzunari Pokémon Nuigurumi) are a series of plush produced by Banpresto from 1996 to 1997. 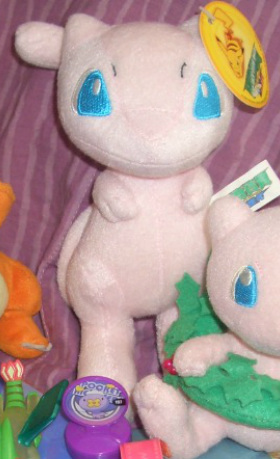 49 styles of first generation Pokémon were released in three separate sets as arcade prizes. Because of their age and distribution, they remain highly sought after by collectors. 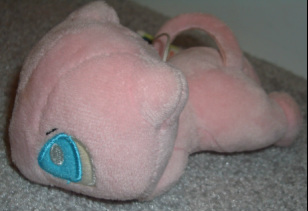 Bell plush are roughly 3 inches/6 cms in height, and possess a small coloured bell from which they get their name. Mine's box is a little beat up, but other than that its in fantastic condition. It's still attached to the bottom of the box too! I got pretty lucky on eBay, I bought it for a good price compared to what I've seen these things go for. The style of this plush is "knit" - which is where it gets its name of "Amigurumi." 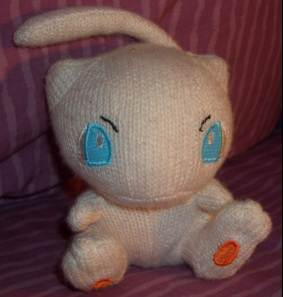 According to Wikipedia, Amigurumi means "knitted stuffed toy" :P I really love this Mew plush, its really cute and I love the knitted look! 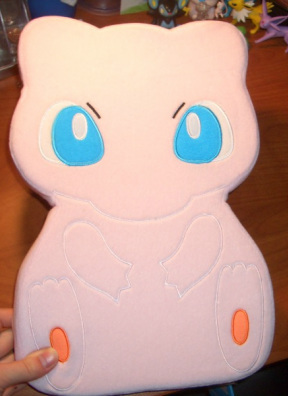 Oh god how adorable is this plush? 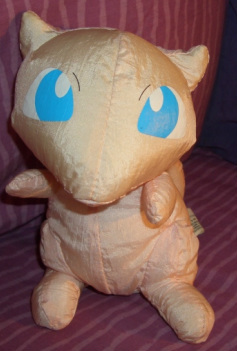 Its a Christmas present that my dad is giving me, but I had to buy it for him since he has no clue about anything Pokemon related XD Thus, I got a little sneak peak before it disappeared into his room! Same story with this one! Also a Christmas present! That is one gigantic head. 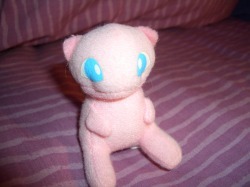 Definitely the most unique Mew plush I own XD Pretty strange looking, and huge. Oh god its terrifying. It was an extra in a GA I co-ran (surprise surprise) so I decided to just keep it. Apparently pretty rare, and also pretty damn ugly! XD Thus, the picture is stayin small!